“The only baby book you’ll ever need” has been widely shared for good reason, and as of this writing I’m about 15% through The Anthropology of Childhood but know it’s going to become the default gift to reproducing friends. Something about American culture seems to bring out neuroticism in people doing what billions of others have done before them; see also Jennifer Senior’s All Joy and No Fun: The Paradox of Modern Parenthood. Expensive, large-scale programs like New York’s Universal Pre-Kindergarten (UPK) or the national Early Head Start (EHS) get launched under the assumption that more schooling, earlier, is better for children, it is not obvious that that is true: “While schooling for us may begin with the fetus (if you can believe the hype about expectant mothers listening to Mozart), most societies don’t see children as readily teachable until their cognitive and linguistic skills have mature. This change usually occurs during the fifth to seventh year [. . .]” (16). Insights occur at the national and personal level. I for example was a mostly unhappy child and adolescent, not I think due to my parents or circumstances or whatever but due to inner disposition, and I interestingly became happier when I realized that we’ve not evolved to be happy: we’ve evolved to survive and reproduce. I wish someone had pointed that out earlier. Happiness may or may not be a byproduct and our default “happiness point” probably varies substantially by individual. Furthermore, in an evolutionary sense happiness may be much more contingent than it is widely considered to be in contemporary America: “In the decision to create a child – whether in an Ethiopian village or elsewhere – their wellbeing and happiness is rarely the issue” (26). And farmer societies tend to take small children and put them to work, while forager societies tend to take steps to limit the number of total children had because children take much longer to become economically viable. To return to my own experience, even as a child I found other children brutal and stupid. Yet almost no one speaks to this idea. Lancy notes that “Our own society views children as precious, innocent, and preternaturally cute cherubs. However, for much of human history, children have been seen as anything but cherubic.” That was my intuition and still is to some extent; few others, apart from Camille Paglia and Robertson Davies have made this point. It may be wrong but it’s barely part of the debate. Many cultures consider babies and small children “sub-human” (16). To be clear, I’m not arguing that American society should do so, but I am arguing that we should know more about our species’s own history and the contingency of our own widespread practices and assumptions. This topic may, however, be especially resistant to inquiry; childhood and parenting may be particularly fraught because almost everyone has opinions on them (and every adult has been a child) but few of us try to figure out what the research says. 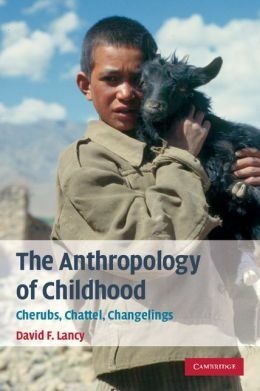 The Anthropology of Childhood is a $40 academic book and thus may not be a particularly accessibly way of entering the mainstream, but it should be better known. It is the sort of book that will repay rereading many times over; this post was meant to be a link, but the writing kept pouring forth until it was a post. Lancy writes that the book began as a short article that was 500 words over his journal’s limit, and he just kept going. It could be read in conjunction with Melvin Konner’s The Evolution of Childhood successfully. « Broadband, sports! go sports!, dirty writers, illiberalism, human flourishing, and more!